...is aunt Sara remade. I am almost six years older than my sister. My first memories in my own life are all of Sara. She was headstrong and hysterical. She always had that unconcerned sort of take me or leave me vibe going on. That is Evie in a nutshell. She's in the stage where taking her picture is a bother. Hence, the awkward pic above! The one I took before that actually had her hand covering her face. I was lucky to get this one. Anyway, It's hard to really explain all of the similarities I see in Evie and Sara. There's a look she gives that I've spent my whole life seeing. There's a sense of adventure and sneakiness that I simply adore. She holds her own like her aunt so bravely it's intense sometimes...and I can't get enough of it. ...the conversationalist. I know she's my child and that every parent thinks their kid is brilliant. I am coming from a place of pure astonishment here, not so much bragging. In fact, if Evie is around other kids her age I get nervous. I'm afraid the other moms might start to question their child's abilities. 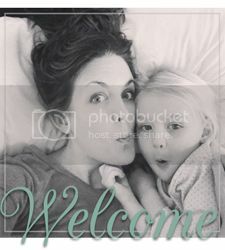 The truth of the matter is kids are so all over the map and completely different that everything you see as a parent must be taken with a grain of salt. 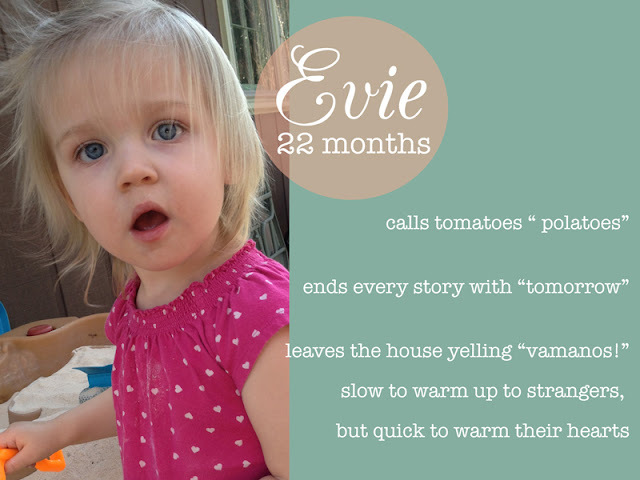 For instance, the little girl down the street who is a month younger than Evie is potty trained. Evie peed on the floor ten times last week and we aren't even potty training. Everyone has their strengths. Evie just happens to talk like a five year old. Sure, she says "polatoes" and random other mispronunciations. I am not really speaking of her vast vocabulary as much as actual conversation skills. Unfortunately, she doesn't show off these skills. She takes a while to warm up, and even then she doesn't run her mouth when there are a lot of people around. Because, you know, she knows how to reel people in. She plays hard to get. Fingers crossed she stays that way. ...the student. Evie goes to a mother's morning out class two days a week. She is 100% attached to the teachers and going to "school". I feel really fortunate that both of my girls can't get enough of going. Evie actually loses her mind most mornings when I tell her that only Lila is getting out at school. I can't tell how much of this is her desire to be just like Lila at every moment, or if she really loves school that much. I'm assuming it's a little of both. ...the big girl. From the minute Evie could walk she has had to do everything herself. For me, this is a big struggle in parenting. Letting your very small child do every last thing on their own takes quite a lot of time and patience. When you are in a hurry you have no time and your patience is wavering. Usually I can get her to compromise with me in situations like that. While she always wants to be the big girl, she is really great at accepting alternate ways of doing things. This requires some creativity, but is almost 100% full proof. ...the eater. It's pretty refreshing to have a less picky eater on my hands this time. Lila has gotten a million times easier to feed, but she's still very particular about what she likes. Evie just likes to eat. She tries new things and usually likes them. The only thing I have found that she consistently turns her nose up at is meat. I have been trying new things myself, and she always wants what I have! That's it for now. Stay tuned for the first "Isn't She Lovely" person I am featuring next week!